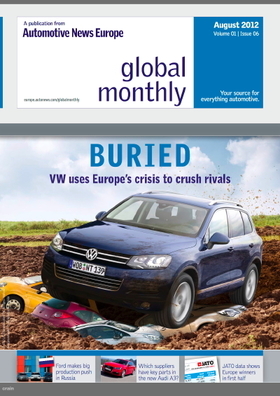 We would like to invite you to see the sixth issue of the Automotive News Europe Global Monthly. This month's cover story focuses on Volkswagen Group's seemingly unstoppable growth, especially in Europe. VW's new architecture is forecast to save the company billions. Fiat-Chrysler team up with Continental on telematics. Chinese firms keep a sharp eye on European suppliers.